In the slide show above, you're viewing pictures of Disney stores & merchandise featuring all the cute Disney characters your children have come to know & love. This page will help you find Disney store locations in the Southwestern USA! What's in a Disney store? Disney stores are actually a very reasonably-priced place to buy merchandise. On top of offering competitive prices even at full retail, the chain offers frequent sales. If you're a Disney Store enthusiast, this comes as no surprise to you. But, if you've hesitated visiting a Disney shop because you think that the words "Disney" and "high prices" go hand in hand, then give them a try. True; Disney THEME PARKS get expensive. Disney store merchandise, on the other hand, can be less expensive than toys or merchandise of comparable quality elsewhere. Though you'll find sales in every department on any day that you go, you'll always find special clearance sales near the rear of the store, as well. 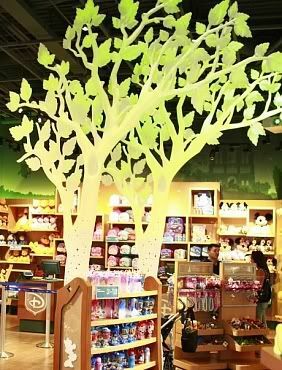 On this page, we'll talk about Disney store locations in the Southwestern states of Arizona, Colorado, Nevada, New Mexico and Texas...plus Disney Stores in some of the Northwestern states, as well. If you're looking for California Disney store locations, no problem. Simply head to the "Disney Store Locations" page of our California blog, Family-Vacation-Getaways.com! Chandler Disney Store location, address at the Chandler Fashion Center mall is 3111 West Chandler Blvd, Chandler, AZ 85226. Here's a Google map to the Chandler Mall & Disney Store. The Chandler Mall's Disney Store phone number is 480/812-1661. Gilbert Disney Store, address at the San Tan Village mall is 2180 East Williams Field Rd, Gilbert, AZ 85242. Directions: from South Loop 202, take the E Williams Field Rd exit; the mall sits directly to the side of the freeway. Here's a Google map to the San Tan Village Mall for your convenience. Within this large outdoor mall, the Disney Store is located not far from the Dillard's Department Store...near the children's playground. To see pictures of the San Tan Mall and discover what other stores you'll find when you arrive, you may wish to view the San Tan Village Mall page of this website. The San Tan Disney Store's phone number is (480) 855-3530. Glendale Disney Store, address at the Arrowhead Towne Center Mall is 7700 W Arrowhead Towne Center, Glendale, AZ 85308. The Arrowhead Mall's Disney store phone number is (623) 486-2928.Directions: From west Loop 101, take the Bell Rd exit to the mall's entrance drive. Here's a Google map to the Arrowhead Mall & Disney Store. Scottsdale Disney Store, address at the Scottsdale Fashion Square Mall is 7014 E Camelback Rd, Scottsdale, AZ 85251. Directions: There are quite a few ways to reach Scottsdale Fashion Square, depending on one's starting point. To plot out your route to this marvelous destination for a shopping safari, please use the following link to view a Google map to the Scottsdale Mall. The Scottsdale Disney store's phone number is 480/994-9616. Tempe Disney Outlet Store, telephone number is phone number is (480) 730-3511; address at the Arizona Mills Mall is 5000 S Arizona Mills Circle, Tempe, AZ 85282. Directions: from the Interstate 10 freeway, take the Baseline Road exit and head 1 block east to the mall. To view this area's layout, head to the following Google map to the Arizona Mills Mall Disney store location. The Tempe Disney store's phone number is 480/730-3511. To find out other shopping fun you can have at this huge & popular outlet mall, please head to the Arizona Mills Mall page of this website, where you may also view a photo of this store. Tucson Disney Store, address at the Tucson Mall is 4500 N Oracle Rd, Tucson, AZ 85705. Directions: There are a number of ways to reach the Tucson Mall depending on your starting point. Please access the upcoming Google map to the Tucson Mall to plot your course. The Tucson Mall Disney Store's phone number is 520/888-7400. Aurora Disney Store, address at the Town Center at Aurora Mall is 14200 E Alameda Ave, Aurora, CO 80012. The Town Center at Aurora mall's Disney store phone number is 303/364-5359. Directions: from I-225, take the Alameda exit; the Aurora Mall sits directly to the east side of the freeway. Please use the following Google map to the Aurora, Colorado Disney location to view the layout of this area. Broomfield Disney Store, address at the Flatiron Crossings Mall is 1 W Flatiron Cir, Broomfield, CO 80021 (which is the same address as the mall itself.) The Flatiron Crossing's Disney store phone number is 303/465-6188. Directions: from the Denver-Bolder diagonal/US 36 freeway, take the Interlocken exit and find the mall located just to the south of the lanes of traffic. The Disney Store is located at the Dillard's end of the mall. Here's a Google map to the Flatirons Mall for your convenience. If you'd like to see pictures of Flatiron Crossings, or discover the list of other stores you'll find when you visit this attractive shopping center, you may view the Flatiron Crossing Mall page of our site. Lone Tree/Littleton Disney store, address at the Park Meadows Mall is 8405 Park Meadows Center Drive, Lone Tree, CO 80124. The Park Meadows Disney store phone number is (303) 790-7704. Las Vegas Disney Store, address at the Meadows Mall is 4300 Meadows Lane, Las Vegas, NV 89107. The Meadows Mall Disney Store's phone number is 702/258-2692. Directions: from US Highway 95, take the Valley View Blvd exit; you'll find the mall directly south of the freeway. To get a better mental picture of this area, here's a Google map to the Meadow Mall & Disney Store. Las Vegas Disney Outlet Store #1, address at the Las Vegas Premium Outlets North is 705 S Grand Central Pkwy, Las Vegas, NV 89106. The Las Vegas Disney Outlet Store phone number is 702/386-2944. Here's a Google map to the Las Vegas Premium Outlets--North, which are located directly to the east side of I-15 just north of Charlston Blvd. To see pictures and find out about other shopping you'll enjoy at this terrific outlet mall, please visit the Las Vegas Premium Outlet page of our site. Las Vegas Disney Outlet Store #2, address at the Las Vegas Premium Outlets South is 7400 Las Vegas Blvd South, Las Vegas, NV 89123; store phone number, 702-263-3069. There is also a Disney Character Warehouse located in the mall's Annex Building...phone number (702) 260-8144. What's the difference? The Character Warehouse sells merchandise formerly sold inside the Disney theme parks...while the Disney Store outlet sells merchandise from the Disney Store chain. The merchandise features the same characters in both stores, but the designs are different.) Here's a Google map to the Las Vegas Disney Character Warehouse. Or, to discover more about the exciting factory stores you'll find in this outlet center, please visit the Las Vegas Premium Outlets-South page of our site. Reno Disney Store, address at the Meadowood Mall is 5280 Meadowood Mall Circle, Reno, NV 89502. Directions: the Meadowood shopping mall can be found at the intersection of McCarran Blvd and Virginia Street, just off the US 395 Freeway. To decide which exit you'd like to use, or to plan a route following the city streets, please see the Google map to the Meadowood Mall Disney location. The Reno Disney Store's phone number is 775/828-5200. There is now only 1 Disney Store in New Mexico. Its location is in the state's largest city of Albuquerque. For residents of Southern New Mexico (the Las Cruces area,) the closest Disney Store for you will be at the Cielo Vista Mall in El Paso, Texas. The closest Disney Outlet Store will be in the Outlet Shoppes at El Paso, located at I-10 and Loop 375 on your way towards downtown El Paso. Albuquerque Disney Store, address at the Cottonwood Mall is 10000 Coors Blvd Bypass NW, Albuquerque, NM 87114. Directions: Travelers will enjoy visiting this beautiful shopping mall, but its location is not near an interstate freeway. To plan your visit, please consult the following Google Map to the Cottonwood Mall Disney location. This west Albuquerque Disney Store's phone number is 505/792-9100. Orem Disney Store, address in the University Mall is 575 E University Pkwy, Orem, UT 84097; phone number is 801/225-0415. Here's a Google map to the University Mall & Disney Store. For further mall info, here's a link to the University Mall website. Salt Lake City Disney Store, address downtown at the City Creek Center is 51 South Main Street, Salt Lake City, UT 84101. The City Creek Disney Store's phone number is 801-532-2476. Austin/Cedar Park Disney Store, address at the Lakeline Mall is 11200 Lakestop Blvd, Austin, TX 78613; telephone number (512) 219-7117. Here's a Google map to the Lakeline Mall you may use for planning out your route. Dallas Disney Store location, address at the NorthPark Center Mall is 8687 North Central Expressway, Dallas, TX 75225; here's a Google map to the North Park Mall & Disney Store. The North Park Disney Store's phone number is (214) 234-0144. Here's a link to the NorthPark website for further mall information. El Paso Disney Store, phone number (915) 778-9408; address (at the Cielo Vista Mall) is 8401 Gateway Blvd W, El Paso, TX 79925. Here's a Google map to the Cielo Vista Mall in El Paso, Texas. Fort Worth Disney Store, phone number (817) 370-1538; address (at the Hulen Mall) is 4800 S Hulen St, Fort Worth, TX 76132. You may use the following Google map to the Hulen Mall to help plan your route, if you wish. Frisco Disney Store, telephone number (972) 712-7499; address (at the Stonebriar Mall) is 2601 Preston Rd, Frisco, TX 75034. The following Google Map to the Stonebriar Center can help you find your way there. Houston/Galleria Disney Store, phone number (713) 622-4737; address at the popular and convenient Galleria Mall is 5085 Westheimer Rd, Houston, TX. 77056. Here's a Google map to Houston's Galleria Mall. Houston/Willowbrook Disney Store, phone number (281) 890-5118; address is 7925 Fm 1960 Rd W, Houston, TX 77070. Here's a Google map to the Willowbrook Mall for assistance in planning your route. Laredo Disney Store, phone number (956) 725-4062; address (at the Mall del Norte) is 5300 San Dario Ave, Laredo, TX 78041. Google map to the Mall del Norte in Laredo, Texas. McAllen Disney Store, phone number (956) 928-1880; address (at La Plaza Mall) is 2200 S 10th St, McAllen, TX 78503. Google map to La Plaza Mall in McAllen, Texas. Mercedes Disney Outlet, see Outlet Section below. Round Rock Disney Outlet, see Outlet Stores section below. San Antonio/Downtown area Disney Store, phone number (210) 227-3202; address (at the RiverCenter Mall) is 849 E Commerce St, San Antonio, TX 78205. Google map to the River Center Mall in downtown San Antonio, Texas. San Antonio/Ingram Park Mall Disney Store, phone number (210) 509-6256; 6301 NW Loop 410, San Antonio, TX 78238. Google map to the Ingram Park Mall in San Antonio, Texas. San Antonio/North Star Mall Disney Store, phone number (210) 366-3331; address (at the North Star Mall), 7400 San Pedro Ave, San Antonio, TX 78216. Google map to the North Star Mall in San Antonio, Texas. San Marcos Disney Outlet, see the Disney Outlet Stores section below. The Woodlands Disney Store, address at the Woodlands Mall is 1201 Lake Woodlands Drive, The Woodlands, TX 77380. The Woodlands Mall Disney store's phone number is (281) 298-5276. Here's a Google map to The Woodlands Mall for you to view. Cypress/Houston Disney Outlet Store, address at the Houston Premium Outlets is 29300 Hempstead Road, Cypress, TX 77433; phone number, (281) 758-2668.Here's a link to the Houston Premium Outlets website for further mall information. El Paso/Canutillo Disney Outlet Store, address in the Outlet Shoppes at El Paso is 7051 S Desert Rd, Canutillo, TX 79835. The El Paso area Disney Outlet Store's phone number is (915) 877-3839. This Disney Outlet is located at the Loop 375 exit of I-10 not far south of the Texas-New Mexico border, making this also the closest Disney Store location for residents of Las Cruces, NM. Please visit our El Paso Outlets page to view mall pictures & discover the other exciting stores you'll enjoy when you visit this attractive outlet center. Grapevine Disney Outlet Store, address at the Grapevine Mills mall is 300 Grapevine Mills Parkway, Grapevine, TX 76051. The Grapevine Mills Disney Store's phone number is (972) 355-4056. Here's a Google map to the Grapevine Mills Mall for your convenience in planning out a route to take. Mercedes Disney Outlet Store, address at the Rio Grande Valley Outlet Mall is 5001 East Expressway 83, Mercedes, TX 78570; the Disney Outlet Store telephone number is 956-565-9480. Here's a Google map to the Disney Outlet in greater McAllen, Harlingen & Brownsville area, for your convenience. Round Rock Disney Outlet Store, address at the Round Rock Premium Outlets is 4401 North IH 35, Round Rock, TX 78664. The Round Rock Disney Outlet Store's phone number is (512) 864-0577. For assistance in planning your route, you may use the following Google map to the Round Rock Premium Outlets. San Marcos Disney Outlet Store, address at the Tanger Outlet Mall is 4015 IH 35 South, San Marcos, TX; The Disney Outlet Store's phone number is (512) 392-8880. Here's a Google map to the Tanger Outlet Center in San Marcos, for your reference. The past few years have been somewhat sad for Disney Store fans. The number of Disney Stores in malls across the USA has been cut back. Some areas have quite a few less stores to choose from than before...and only a few areas got new Disney Stores. NO Disney Stores in ID, MT, ND, NE, SD, WY: Unfortunately, there are currently no Disney Stores in the western states of Idaho, Montana, Nebraska, North Dakota, South Dakota nor Wyoming. Overland Park Disney Store, address at the Oak Park Mall is 11447 West 95th Street, Overland Park, KS 66214. The Oak Park Disney store's phone number is (913) 492-5333. Here's a Google map to the Oak Park Mall & Disney Store. Oklahoma City Disney Store, address at the Quail Springs Mall is 2501 West Memorial Road, Oklahoma City, OK 73134. If you need help finding your way, here's a Google map to the Quail Springs Mall & Disney Store location. The Quail Springs Disney Store's phone number is (405) 755-4555. Oklahoma City Disney Outlet Store: Disney fans may now enjoy shopping at a Disney outlet store in OKC! It's located at the attractive Shoppes at Oklahoma City outlet mall; address, 7628 West Reno Avenue, Oklahoma City, OK 73127; phone number, (405) 787-0007. Here's a link to the Shoppes at Oklahoma City website for further mall information. Tulsa Disney Store, address at the Woodland Hills Mall is 7021 South Memorial, Tulsa, OK 74133. For your convenience, here is a Google map to the Woodland Hills Mall & Disney Store to help you plan your route. The Woodland Hills Disney Store phone number is (918) 249-8206. Portland/Happy Valley Disney Store, phone number (503) 786-4020; address (at the Clackamas Town Center Mall), 12000 SE 82nd Ave, Happy Valley, OR 97266. You may use the following Google Map to the Clackamas Mall & Disney Store to help find your way. Bellevue Disney Store, address at the Bellevue Square Mall is 172 Bellevue Square, Bellevue, WA 98004; phone number, (425)451-8300. Here's a link to the Bellevue Square website if you'd like further info about the mall. Lynwood/Seattle area Disney Store, phone number (425) 744-9855; address (at the Alderwood Mall Shopping Center) is 3000 184th St SW, Lynnwood, WA 98037. Here's a Google map to the Alderwood Mall & Disney Store to help you find your way there. Tukwila Disney Store, address at the Westfield Southcenter Mall is 536 Southcenter Mall, Tukwila, WA 98188; phone number is (206) 241-9887. Here is the Westfield Southcenter Mall website, where you may discover more mall information.